The “G” in G-Scale originated from the German word groß meaning “big”, although most people have come to interpret it as standing for Garden scale. Without a doubt, the introduction of “Lehmann Grosse Bahn” (LGB) by toymaker Ernst Paul Lehmann Patentwerk in 1968 was pivotal in the popularization of garden railways. Eager to cash in on the new garden railway market created by LGB, a handful of manufacturers rushed American-looking trains to the market in a wide range of periods and scales, which then led to quite a bit of confusion from modelers who discovered that hardly anybody’s trains looked quite right with anybody else’s trains. As can be expected this situation led to frustration and discontent and sadly, what started out as a call for standardization quickly turned into demands by separate camps that the entire hobby standardize on the scale of their favorite manufacturer. Paul Race (Family Garden Trains™) in his article about the “scale of the trains you may choose to use”, states that he observed (after decades in the hobby), that a good, maintainable track plan with wide curves and an attractive setting are far more important long-term to most garden railroading families than what trains are running on those tracks. The 45 mm gauge originated from “Gauge One” (initially defined as 1.75″, but is now defined as 45mm or 1.775″) and has been in use for over 100 years. 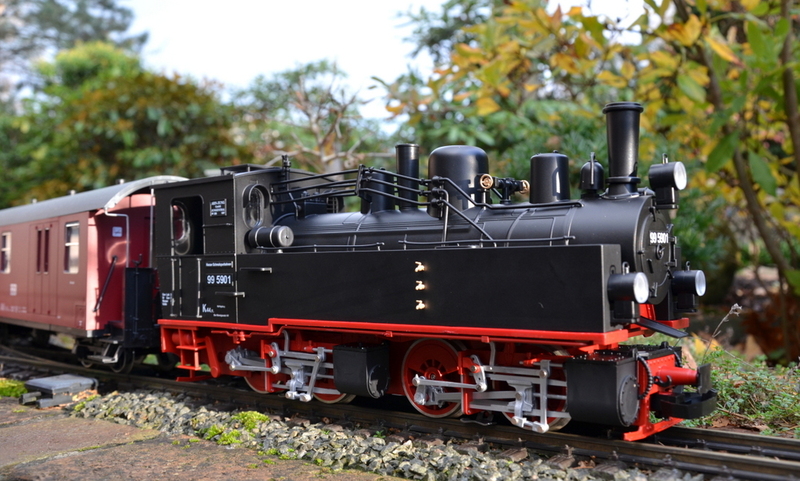 Popular in Europe and England among live steam hobbyists, modeling in a scale of 1:32. Hello…if you have been following the class so far, you will have noticed that in all the smaller scales (Z, N, TT, HO/OO), the scale stays the same and the track gauge changes when you go from standard to narrow gauge. But in Large Scale, the track gauge is standard (Gauge 1), with the changes only in scale! One of the first things most people notice when they are exposed to garden railroading is how realistic Large Scale trains look. No question, you can spend a lot of money on garden railroading. When you visit the stores or other people’s railroads, you may begin to think that thousand-dollar locomotives and $6.00-a-foot track are the norm. While there certainly is no upper limit as to how much you can spend on your layout, most garden railroading families have built enjoyable, charming, and even notable garden railroads without having to sell the house! Various Garden Railway articles, content submitted by various readers, content written by garden railway modelers (ie Paul Race). As always, please remember that I do not take credit for other peoples work, and that I derive no income from content presented here.